Okay, I admit it. I've had this book sitting on my office shelf for years. When I worked in a middle school library, this book was checked out constantly and kids were always placed on a wait list to read it. I knew it was popular because of the big Newbery Medal winner sticker on the jacket. When I was asked to read for the very first time, I knew I had to finally give this one a try. I hope you do too! Meg, her brother Charles Wallace, and their friend Calvin defy their personal beliefs of space and time when they magically travel through a "wrinkle" to save Meg and Charles Wallace's father from a dark and mysterious force called "The Dark Thing." With the help of three otherworldly old women, Mrs. Who, Mrs. Whatsit, and Mrs. Which, they journey to other planets and meet mystical creatures who are all in a war against this evil force. When Charles Wallace is overtaken by It, the Dark Thing leader, Meg must gather all of her strength and brave the creature on her own. Even if that means losing her own life or not seeing her family or Calvin again. A Wrinkle In Time is a fantastical journey with a classic good versus evil plot. Cute, smart kids versus an evil, unexplainable force. The children must believe in things they don't understand and things that seem impossible. Isn't that the very definition of fantasy? All three children are gifted in their own way and highly inquisitive, but they have difficulty wrapping their head around the strange things they are told and experience. Looking through crystal balls, talking with creatures who do not understand the concept of light and dark; the children are constantly being challenged on what they always thought was conceivable. There are mild religious undertones which have landed this book on ALA's 100 Most Frequently Challenged Books. Wrinkle has been challenged for various reasons including fostering "occult practices" and challenging ones belief in God. Personally, I do not think the religious voice is overwhelming at all and the talk of God and His purpose falls in line with the overall plot. I also think L'Engle was way ahead of her time and others had a hard time accepting her imagination. I absolutely enjoyed this book and I can see why it has resonated with children and adults for generations. L'Engle wrote with a sophistication you don't often see. The setting and dialogue wasn't filled with 60s jargon and references. She kept the story clean and timeliness. 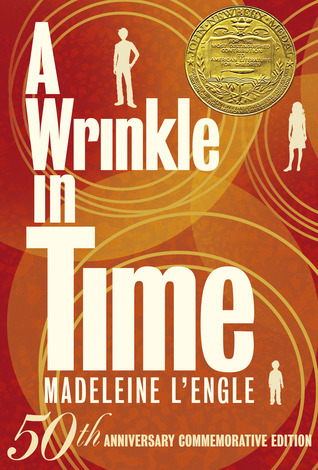 A Wrinkle In Time will remain on library shelves and in the heart of every fantasy and science fiction reader for years to come! If you are looking to purchase a first edition copy and have big time money to spend, HERE you are.